Not a fan of this. 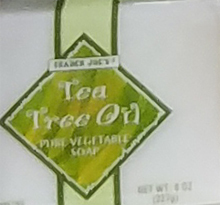 It didn’t smell like tea tree oil at all (which is even more surprising since tea tree oil is so strong even in very small doses), and didn’t lather as well as a lot of other bar soaps. It also didn’t really seem to do much for skincare. I wouldn’t purchase this one again. A great fan of this soap. 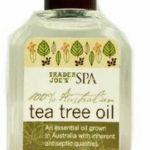 It has a gentle tea tree oil smell that is not overwhelming. It lathers beautifully and my skin feels great. This has been our everyday soap for many years. I’d like to buy it again but it seems to have disappeared. Fantastic soap. Had been using it for 20 years or so. Seems like TJ’s discontinued it, however. The best soap for my sensitive oily skin. Never any irritation. Been using it for 17 years. But the corporate dummies discontinued it, (just like they did to the Chocolate Ganoche Torte). But, I bought it by the case, and still have enough left until the Rapture! Maranatha! Great soap bar. I used it for several years. It helped rid my foot fungus and kept it away but now not available anymore. Now I am on a hunt for a similar one elsewhere. 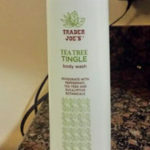 Trader Joes, why get rid such a great product? This is a great soap. I’ve used it for showering and shaving for at least 5 years. It has kept my skin in very good condition. I was very sad to learn today that it has been discontinued. Please bring back this soap. Suggest making the label more flashy. Product has disappeared from the shelves a couple months ago. Someone is selling it for $20.00 on eBay…. I would usually buy 8 packages at a time when i could find it in stock because it was very popular and always sold out fast. I’m on my last bar now and just today I was told this was discontinued! Why? Please bring this back, I can’t find anything like it, or at least tell us the vendor who makes it so we can still buy it. I have used this soap for years. So bummed that I can no longer find it. 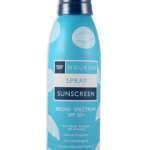 Broad spectrum, SPF 50+, and water repellant. 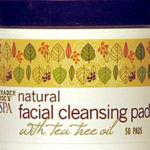 Made with coconut oil, Shea butter, and pumpkin seed oil. 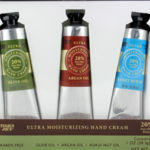 Sets of three hand creams with olive oil, argan oil, and kukui nut oil.